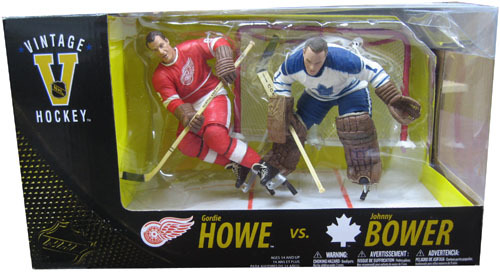 Description Of Item: Howe is painted in Detroit's red jersey for the first time, while Bower showcases the white Toronto jersey that debuted as a chase figure in 2007's NHL Legends 6 lineup. This confrontation takes place on McFarlane Toys' Classic Hockey Goal base, where both figures display perfectly for a one-on-one showdown. Mr. Hockey goes glove-side against The China Wall and only you can decide the outcome.